Moong dal, also known as split mung beans, is a very common ingredient in both Indian and Vietnamese cuisines. In this particular savory dish, the lentils serve as a complementary protein to the spinach. When paired with rice, it's a complete meal in and of itself. 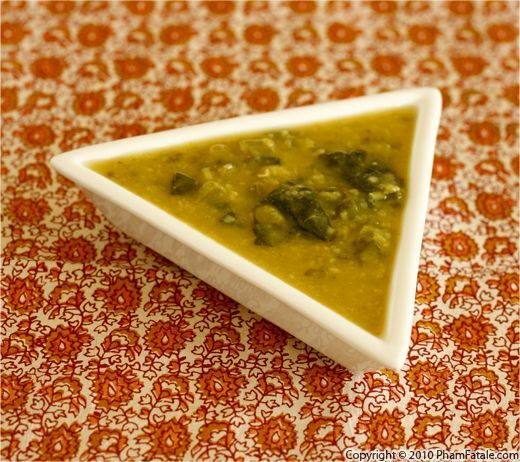 There is a wide range of dals used in Indian cuisine, far more than you may find at an Indian restaurant buffet. Check out my other Indian dal recipes such as toor dal, kali dal, urad dal or masoor dal if you're feeling adventurous. This glass noodle dish (also known as cellophane noodles, dam myun in Korean and harusame in Japanese) is made from sweet potato starch. The dish is very similar to chow mein, but aesthetically the noodles look translucent once they're boiled and their texture is chewier. I prepared the noodles with king mushrooms, oyster mushrooms, pan-fried tofu, baby spinach, carrots, sweet potatoes and cauliflower. The dish is relatively easy and quick to make if you have all the veggies prepped in advance. This side dish couldn't be easier to make. 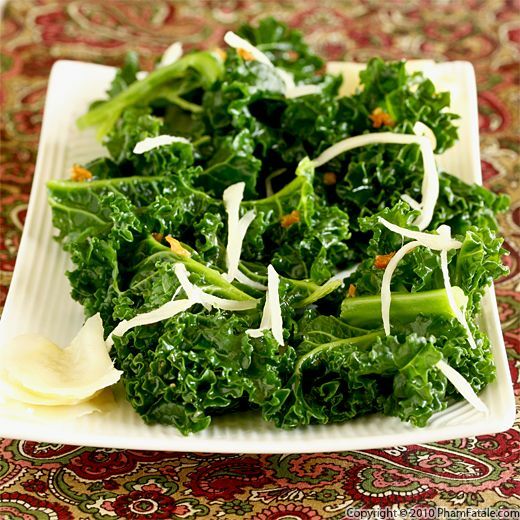 Onions and kumquats are slowly caramelized with ginger and agave nectar and added to slightly sautéed kale. What could be better than a dish that's delicious, healthy and simple? I was inspired to make this dish by a reader. Chef Doreen T. Ross is a culinary artist and consultant from North Carolina. 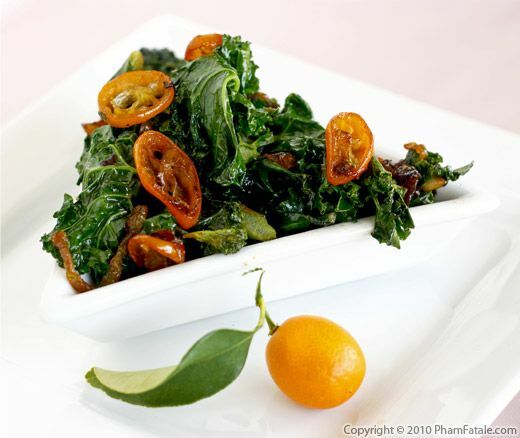 Doreen sent me a recipe suggestion using kumquats (I've asked for recipes using this ingredient) with wilted kale. I've adapted Doreen's recipe and added an Asian twist to it. Sunny and Lulu were my guinea pigs, and they loved it. Merci Doreen! As I've said several times, I'm just a home-cook who is passionate about food and has had no professional training. Creating this site has really broadened my culinary horizons. I've received many lovely messages filled with kind words and a ton of tips and culinary tricks. Thank you all for your support, and please keep those messages coming. 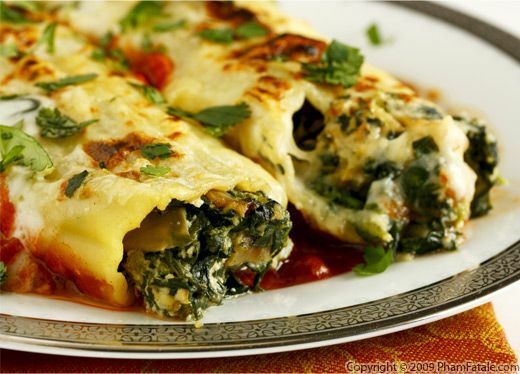 I stuffed my manicotti with artichoke and spinach, and served the dish gratin-style with a layer of mozzarella cheese over the top and a bed of marinara sauce beneath. The artichoke and spinach mixture evokes the flavors of a dip, which contrasts nicely with the brightness of the marinara. This is one of my favorite pasta dishes because it's very easy to make, while at the same time having great presentation value. Manicotti have the added benefit of freezing extremely well, so I always make them in large batches.